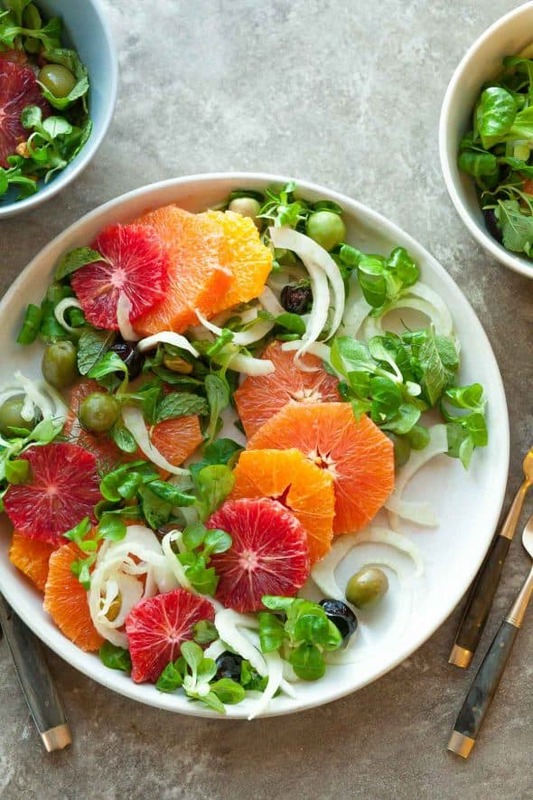 A colorful, sweet and salty citrus and olive salad. Just when you’ve had about enough of winter’s meager offerings in the fruit department, in comes citrus, like a much needed ray of sunshine. If it wasn’t for citrus fruit, winter produce would be rather drab and dull, but thankfully oranges are beginning to hit their prime with more varieties on the way. Beyond the standard navel orange, there are: Cara Caras and blood oranges. Besides their beautiful inside hue, cara cara’s and blood oranges have a distinctive flavor that’s sweeter and less acidic than ordinary navels with overtones of red berries. 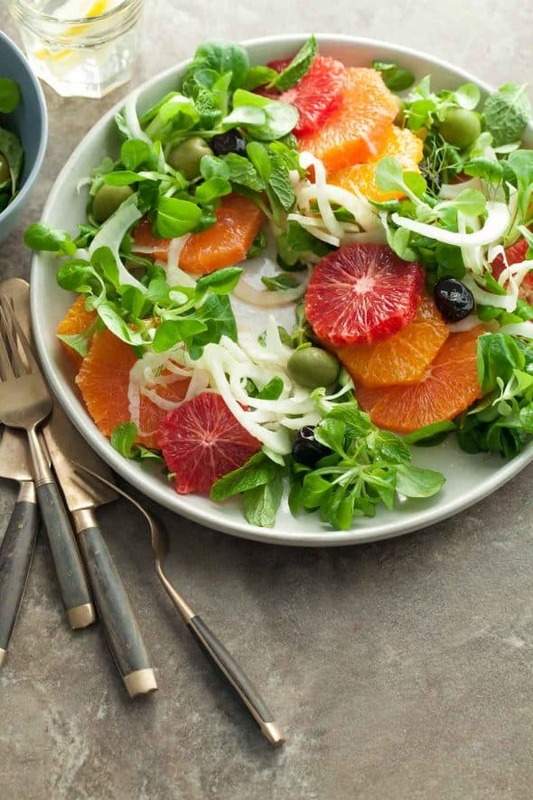 They are my favorites for eating out of hand but also shine in more savory dishes like this orange and olive salad. 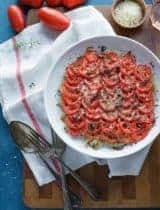 Your initial reaction might be one of doubt, yet this sweet and salty combination is a classic throughout the Mediterranean where it shows up frequently in Sicilian cuisine. 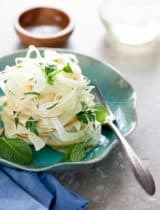 It’s a lovely little salad, quite elegant both in presentation and taste; a colorful and mouth-watering mix of flavors. While it may initially sound unusual, the combination of sweet/tart oranges and fruity/salty olives is one that’s both bright and refreshing. In its simplest form all you need are oranges, olives, olive oil (the best you can get your hands on) and a generous pinch of sea salt, but adding a few extra touches like super crisp slices of fennel and buttery mâche lettuce leaves make for a more substantial salad while remaining refreshingly light on the palate. For the olives, I like a mix of intensely flavored and wrinkly salt cured black olives and briny and buttery green castelvetrano olives. 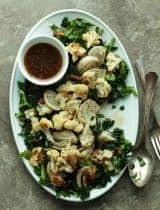 The dressing is a simple mix of citrus juice, olive oil a pinch of fennel seeds and a few drops of orange flower water (I always have a bottle in the fridge, it lasts forever and gives such a nice floral taste to so many dishes). 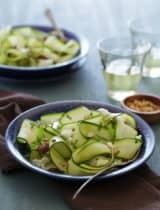 A few mint leaves are sprinkled throughout for freshness and pistachios add a nice toasty crunch. 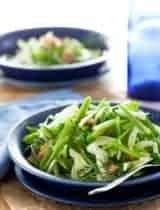 With its sweet and salty flavors, and bright fresh flavors this is a winter salad to brighten the dreariest of days. 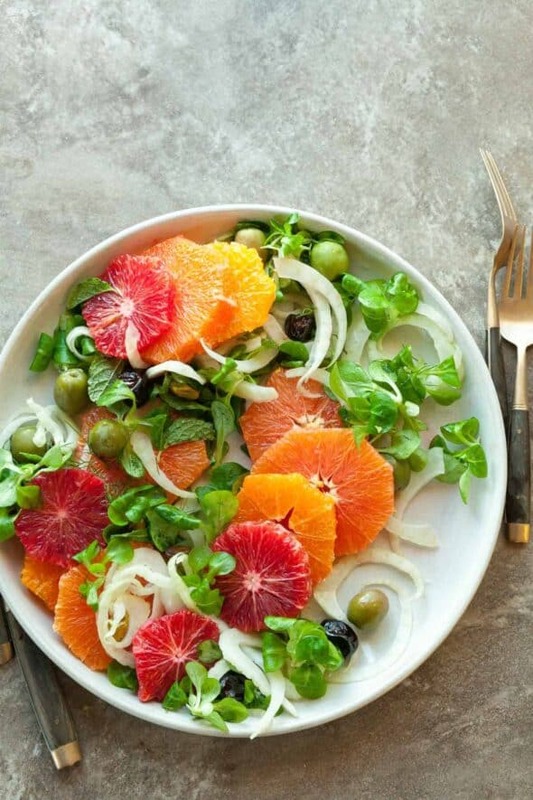 A colorful sweet and salty citrus and olive salad. 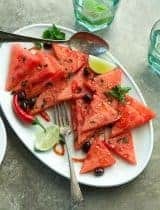 Using a sharp knife cut a thin slice off top and bottom end of the fruit. Stand upright on a cutting board. Working from the top to the bottom, cut away the peel and pith following the contour of the fruit. Repeat with remaining fruit, and then cut crosswise into ¼-inch-thick slices. 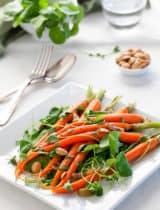 Place mache lettuce, mint leaves and fennel on a large platter and tuck in orange slices and olives. Whisk together citrus juice, olive oil, salt, fennel seeds and orange blossom water if using. 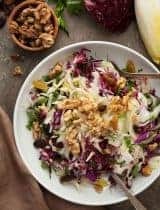 Drizzle salad with dressing and top with chopped pistachios and reserved fennel fronds. Taste and adjust for seasoning.